This week’s guest editor, Bruce Allen has a practice based in Melbourne, Australia but has done projects in China, Hong Kong, Moscow and the Pacific Islands. He teaches at RMIT and Monash Universities and is a Life Fellow of the Australian Institute of Architects. The economy of cities now requires maximum use of existing infrastructure. It is necessary to use excess capacity before stretching the budget for further expansion at the fringes. Under utilized sites and existing building stock offer potential for innovation that benefits both the environment and the economy. We must do better with what we have. This week we look at three very different examples of interstitial projects where sites and buildings have been developed to provide increased density and better use of space with improved sustainability and amenity. The GL31 designed by Pascal Arquitectos in Mexico achieves an increase in density without impacting on the amenity of the street. It is a creative example of medium density urban living incorporating innovative planning, appropriate scale and a respect for the amenity of adjoining properties. Similarly the Via Broletto 9/11 office building designed by Beretta Associati in Milan increases the density of commercial space by stitching together two existing buildings with a steel and glass masterpiece. 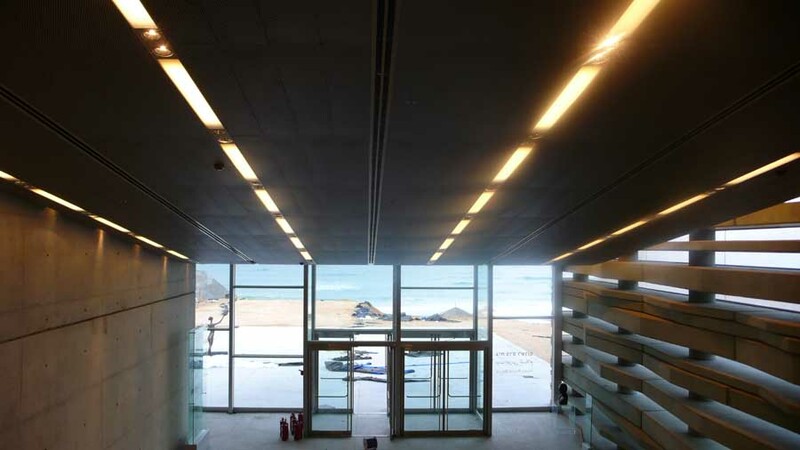 The intervention provides a stunning state of the art headquarters building. The natural light and transparency of materials provides a stimulating and environmentally sound working environment. However the transparent circulation system may mean that the wearing of kilts and dresses is inadvisable. The proposed Golden State Warriors Arena on the waterfront at Piers 30-32 in San Francisco and designed by Snohetta + AECOM has found space by moving into the water. This has been done with confidence because it is a place for the people and provides public access to the waters edge, which be extended in length by the new arena proposal. Unlike the water edge expansion of Lower Manhatten and Hong Kong the arena will stand alone reflecting the Bay by day and becoming an illuminated hive of activity at night. The found site will be multi functional with berthing facilities and a fire station. It will be a challenge to discharge a packed arena on one side only but a spiral ramp system will move large volumes of the crowd efficiently and at the same time provide panoramic views of the bridge and bay. On a more somber note we look at the new Jerusalem Holocaust Museum designed by Safdie Architects which replaces the Museum built in 1953. Unlike the Eisenman Memorial to the Murdered Jews in Berlin, this combines the role of memorial and place of remembrance with an archive and educational centre. When marveling at the awesome work by Safdie I wonder why this has been done now. Did the 1953 model wear out? My anecdotal experience suggests one possibility. Melbourne is indebted to a wave of Jewish migration after World War 2. The migrants brought with them a culture of music, the creative arts, governance and academic excellence previously lacking in the antipodes. Melbourne was as far as they could go to get away from the horror of the holocaust. The next door neighbor to my studio was an Auschwitz survivor. He died of old age a couple of years ago. He explained to me that after the holocaust experience he tried to suppress the memories and protect his children’s generation from the details of the atrocities. As he approached the end of his life he changed his mind because he wanted the truth to be documented so that future generations would not repeat the same mistakes. Perhaps this age group of survivors share these sentiments and so as they approach the end of their life the need for memory and remembrance has been revived and younger generations are wanting more information. My neighbor, Ziggy commented that as an old man his ageing body reminded him of his emaciated body as a twenty year old in captivity. He found that 65 years later, he subconsciously used techniques developed in Auschwitz to lift heavy objects. The memory would not go away. May 14, 2013 in Articles.